One of the best nature experiences in Cairns! See the World heritage rainforest via the Skyrail Rainforest Cableway and the Kuranda Scenic Railway and visit rainforestation where you can ride in an amphibious WW2 army duck, see koalas, kangaroos & crocodiles and learn about the aboriginal history from the Pamagirri Aboriginal guides. Transfers and entry to Rainforerstation. 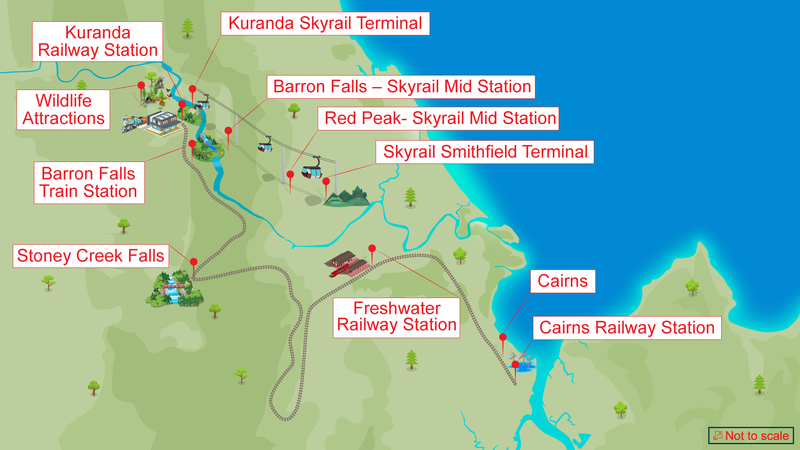 this is a full day adventure to Kuranda, located in the middle of World Heritage Rainforest. Your experience includes a journey on the historic Kuranda Scenic Railway, before visiting the award-winning Rainforestation Nature Park, where you can take a tour on a historic World War II Army Duck over land and through water. Join a guided tour and see crocodiles, koalas, snakes, dingoes, a cassowary and the only Tasmanian Devils in North Queensland. Handfeed kangaroos and wallabies, and even cuddle a koala (additional cost). The Pamagirri Aboriginal Experience is unforgettable. Follow the Dreamtime Walk down the Rainbow Serpent pathway, and learn how to throw a boomerang. Our Pamagirri guides will demonstrate traditional spear throwing as well as a didgeridoo presentation, followed by an interactive traditional Aboriginal dance performance. Enjoy a sumptuous hot buffet lunch overlooking the lake, as well as tropical salads, fruit, cheeses and sandwiches. Try some of the fresh fruits, juices and ice creams available in the Tropical Fruit Orchard, and learn about the different exotic fruits we have growing on the property. Enjoy a relaxing return to Cairns, travelling on the Skyrail Rainforest Cableway, just metres above the rainforest canopy. Hotel transfers available for most Cairns CBD hotels. Please note that hotel pick ups may be prior to the advertised departure time from Cairns. Under 4 years travel free as an infant, but must be included in booking details.